The Magellan might be the best car gps unit that Magellan have ever made, have an endless supply of features to help you get to your destination and come with a price tag that is both realistic for road users, however it still has a long list of problem that means that you have to question whether you should be buying a Magellan gps for your car or one of the best brand names gps unit such as the Garmin 2797LMT that we recommend our users to buy. The 6230LM comes as standard with a 5 inch touch screen that whilst is not the most responsive on the market does provide the user with good screen clarity whether in direct sunlight or at night. The gps unit also contains a speaker to hear the turn-by-turn directions, a camera lens that can be used for the dash cam, and a microSD slot for saving recorded video. Once you’re ready to use your gps unit, simply press the power button on the top right of the device and it quickly powers up to provide you with Magellan’s recently designed homepage that comes with Magellan’s OneTouch Menu which let’s you create shortcuts to your favorite destinations. To enter your destination, simply bring up the keyboard and quickly type in your destination. If you’re looking for Points on Interest, you can search location that are near you, near a landmark or even in a city of your choice. We found this feature worked particularly well and much better than either TomTom or Garmin. Pressing “Go” allows the gps unit to calculate your route and turn-by-turn directions are given to you both on screen and via the speaker. Like the brand named gps unit, Magellen also uses a smart feature that means your more likely to hear turn left after the petrol station than turn left after 200 meters which users found very confusing and difficult to understand. One problem we did face was that the navigation tended to be more that a couple of moved ahead of where you were meaning that you do have to listen to what’s being said each time. Directions work well with the gps unit having enough power to quickly re-calculate routes should you make a mistake and giving you lot’s of information along your route to help you get to your destination on time. Your estimated time of arrival, your current speed and speed limit are shown on the screen as you drive and you can tap the screen for further information such as your distance covered and time remaining. 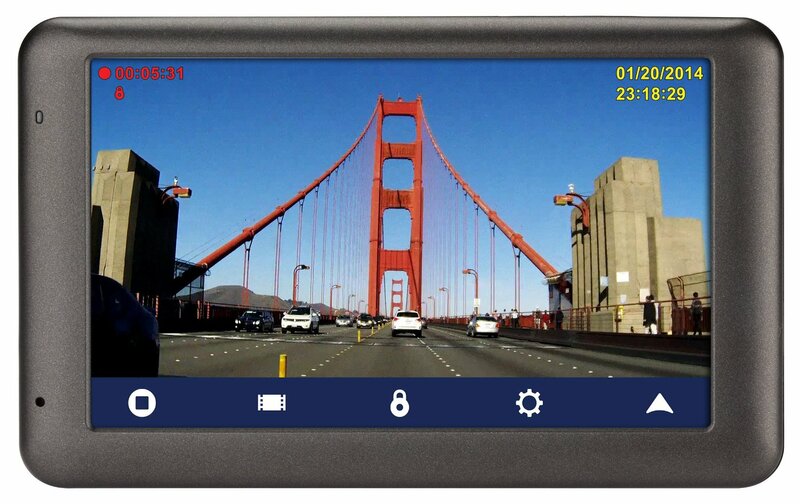 As an added benefit, the Magellan RoadMate 6230-LM comes with a DashCam that videos everything in front of you and stores it on an internal 8GB microSD card. The dashcam has a CMOS sensor with a 120-degree wide-angle lens and screen resolution of 1280 by 720 pixels. The dashcam works either by being set to continually record or you can manually record with the touch of a button. DashCam’s are becoming the norm right now and can be used to help reduce your insurance premiums. The mount comes as a standard two piece unit that locks on to the back of the GPS device and a suction cup mount that fits onto the windscreen to ensure that you can see your gps unit as you drive. The volume is very low even on max meaning that you have to close all the windows and switch off any music to hear the gps unit. The DashCam play-back is very shaky given the mount does not have any give in it.